Spring time! Plant brassica family seeds..
Green greetings to you all. Can you smell spring? Is it green? 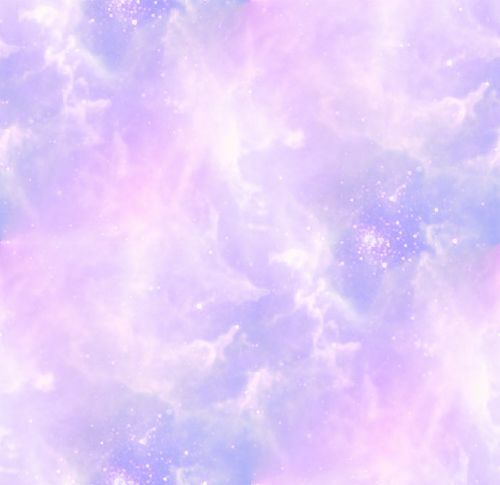 Is it sweet? Is it wet? Before you tell me that winter isn't over, I want you to go outside. Not just once, but once a day for the next few weeks. Look at the buds on the trees. Watch as they respond to the growing light, swelling and getting ready to unfurl. Be on hand for the real beginning of spring. Now! Put your hands on the trunks of trees and see if you can feel the sap rising. When the daytime temperatures are above freezing and the nighttime temperatures are below, the sap surges up the tree. This is when we tap the maples and gather some of their copious sap to boil down into maple syrup. Be on hand this year for the running of the sap. Now! Be on hand for the first emerging leaves in the garden. Be there when the purple nettle shoots first break ground. Be looking when the cronewort leaves double in size overnight. This year watch spring from the very beginning. Starting now! Watch it culminate in flowers, not start there. 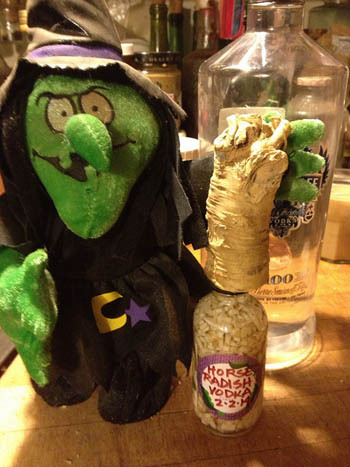 In this photo, you can clearly see the sprouting leaves of the horseradish root I bought at the supermarket. There are two strong plants there, as well as all the root I used to make Horseradish Tincture and Horseradish Sauce. Cabbage family plants, like horseradish, love the cold weather of very early spring. In some areas, they will overwinter and spring into action with fresh leaves in the coming weeks. As the light grows, so do they. (Since I have temperatures below 0 F, my brassicas do not survive the winter.) In the woods, it is time to look for wild cresses, like Barbara's cress and watercress, and that most reviled of modern weeds: garlic mustard, also known as wild horseradish. This year plant some brassica seeds – radishes or kale, bok choy or collards – in the garden as soon as you can, as soon as the frost is out of the ground. And plant some horseradish too. Horseradish. The horse of radishes. The crying radish. Dear friend of my sinuses. And one of the few perennial brassicas. A culinary plant, yes, but a highly medicinal one as well. 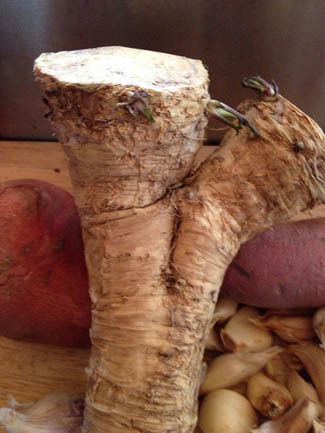 Horseradish is in the markets now and the roots usually have buds on the upper surface. If planted (along with several inches of the root) within 4-6 weeks of being purchased, they generally grow into fine plants. 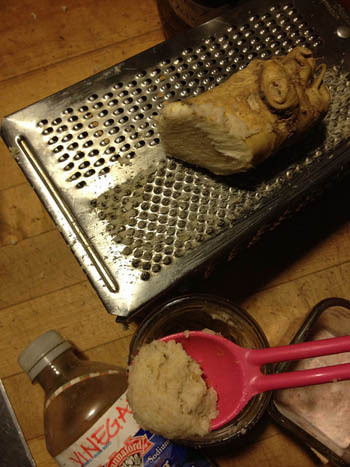 Just one horseradish root will provide you with a plant or two for the garden and plenty left over to try out this week's recipe. Makes your eyes water and clears your sinuses. Intense! 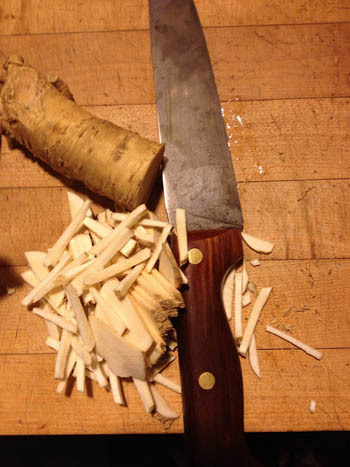 Slice horseradish root into thin even disks. Cut disks into thin even strips. Chop strips into a small dice. Fill jar to the top with diced horseradish. Add 100 proof vodka and label. 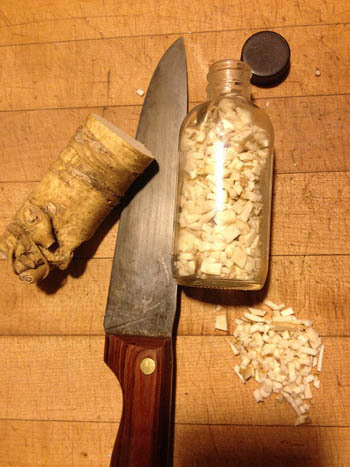 While it is typical to wait six weeks before using a tincture, if the horseradish is finely chopped, this tincture can be used within 24 hours after preparation. The longer it sits, the stronger it gets. Start with 5-10 drops doses and increase as needed to clear nasal and sinus congestion. Grate horseradish on the very finest screen of a box grater. Add a little salt and a little vinegar. 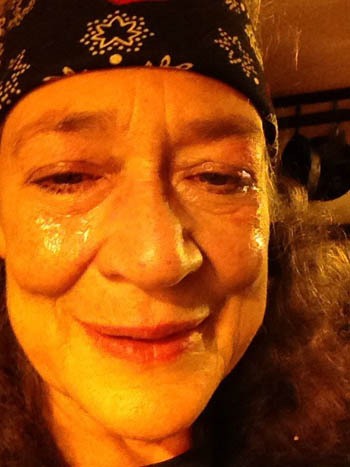 Eat immediately with cabbage, kale, bread, or meat. If you are brazen, eat it neat. Creating this sauce with fresh horseradish will make your eyes stream and clear your head all the way through the crown chakra! Add a little beet juice or grated beet and your Horseradish Sauce will be red. Add a little cream and a tiny bit of sugar and you will have Cream Horseradish Sauce. 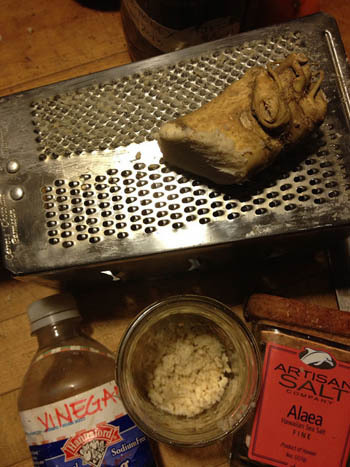 Add a little astragalus root powder and you will have Horseradish Immunity Sauce. 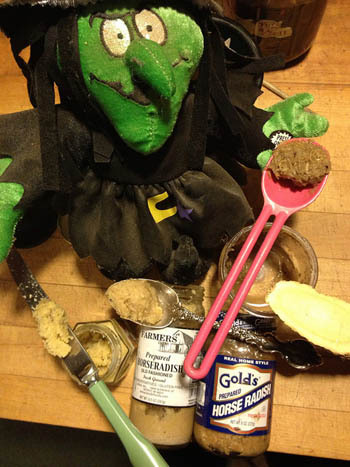 A variety of homemade and store-bought horseradish sauces. From the left: Cream Horseradish Sauce, Horseradish Sauce, Wild Garlic Root Sauce (one year old and still strong). Plus two jars from the store each labeled: "Contains horseradish root, vinegar, and salt." 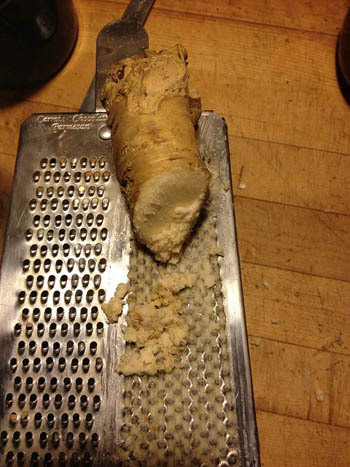 And there's a bit of whole horseradish root in the shot too.